Our 20th Magazine Cover Photo in Coast to Coast + Trailer Life Feature! We are really proud to announce that we have published our twentieth magazine cover photo! It is showcased on the Summer 2016 issue of Coast to Coast Magazine, and it’s a pretty shot of our buggy at sunset in eastern Oregon. Inside the magazine, our cover story reveals many special hidden gems for RVers that can be found in the northeastern corner of Oregon. Unlike the cool and dramatic Oregon coast where towering rock cliffs plunge straight down to the crashing Pacific surf below, the eastern part of Oregon is high desert, a parched and hot land where you can still see the wagon wheel ruts from the pioneer wagon trains that traveled west on the Oregon Trail. 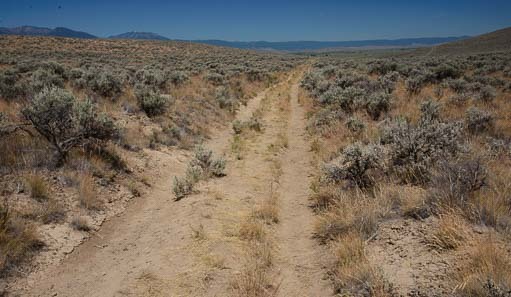 We stood on the original wagon train ruts on the Oregon Trail…Incredible! A while back we took our RV from Bend, Oregon into eastern Oregon. We visited the new Oregon Trail Interpretive Center and hunted down the wagon wheel ruts that are just a ways outside the museum. Staring down the road that once had pioneer wagons on it as far as the eye could see, we marveled at the differences between the early 1800’s and now, both in modes of travel and in our country. Eastern Oregon offers a beautiful glimpse into an earlier era. In Baker City we were charmed by the historic downtown that is lined with Victorian era buildings, and we loved the quiet and intimate feeling that this small city of 10,000 exudes. What a surprise it was to find out that, unlike other major cities in Oregon and neighboring states that have quadrupled in size in just a few decades, the population in Baker City hasn’t changed since 1940. 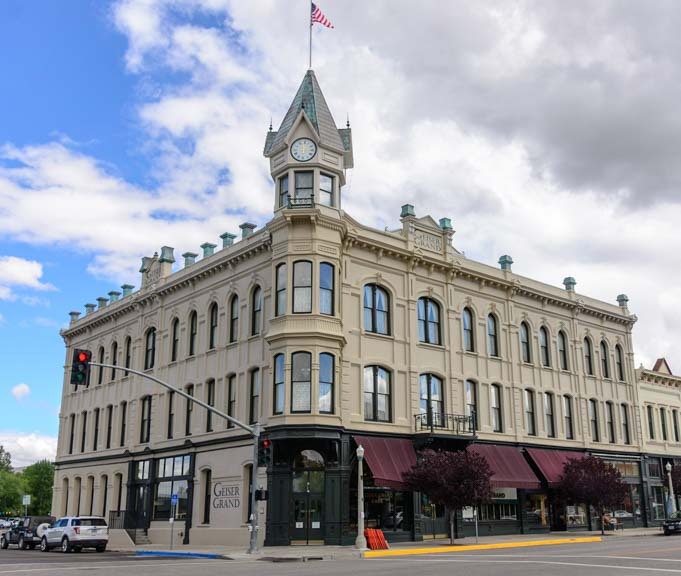 The beautiful Geiser Grand Hotel was built in Baker City in 1889. 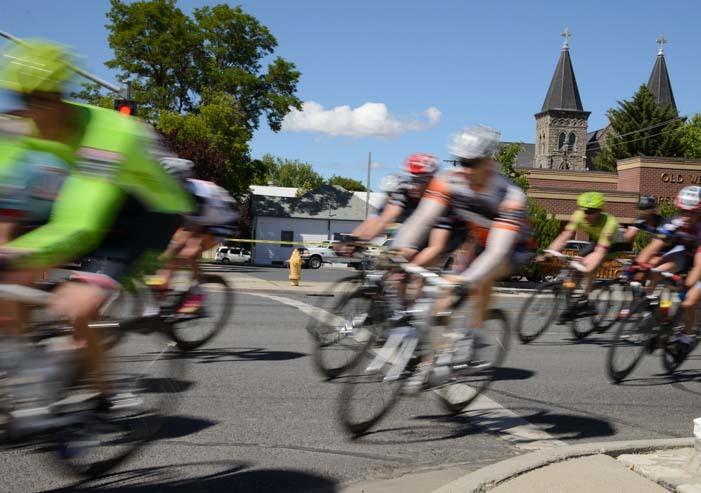 Baker City is also home to the fabulous annual Baker City Cycling Classic Bike Race whose final event takes place in the downtown city streets much like the last stage of the Tour de France. While cyclists fly by at 35 mph, fans drink beer on restaurant patios and cheer the riders on. It’s quite something! Traveling out into the even more remote reaches of northeastern Oregon, we found the towns became so small that each was home to just a thousand or two thousand people, and they were spaced ten miles or so apart. 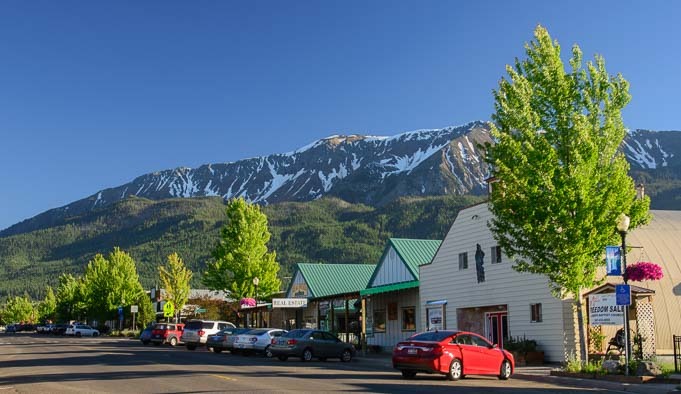 We arrived in the charming village of Joseph that sits at the base of the beautiful Wallowa Mountains and fell in love with the area. It takes so long to get to Joseph from any major city that everyone who goes there sticks around for a while, and not all that many people go there. 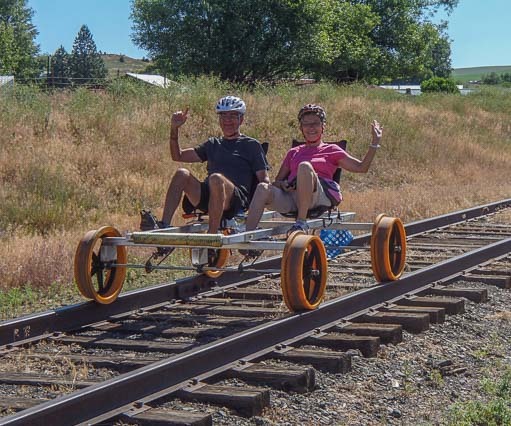 There is a wonderful state park for camping right on the edge of beautiful Wallowa Lake, and there are oodles of fun things to do, from visiting a bronze foundry to riding special “bicycles” built for the narrow gauge railway line that runs between Joseph and Enterprise. We also took a wonderful gondola ride to the peaks of the Wallowas to have lunch with a fabulous view at the Summit Restaurant and enjoy a hike around the top of the mountain. Seeking more mountain views, we hiked the Hurricane Creek trail in nearby Enterprise where we passed meadows of wildflowers in full bloom. Then we visited Hell’s Canyon, both from the overlook on the Oregon side and from the water level on the Idaho side. 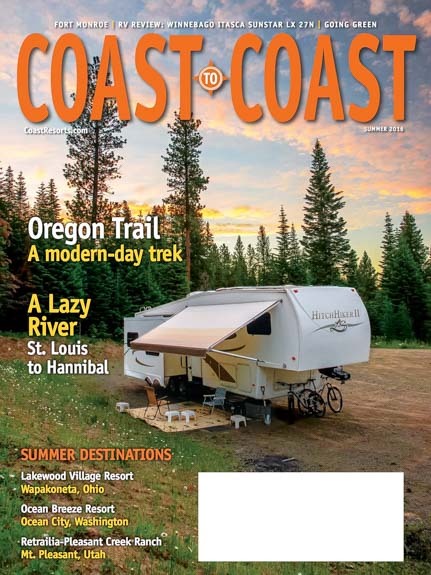 Coast to Coast is the membership magazine for Coast Resorts, an RV park membership program with a network of around 400 parks. 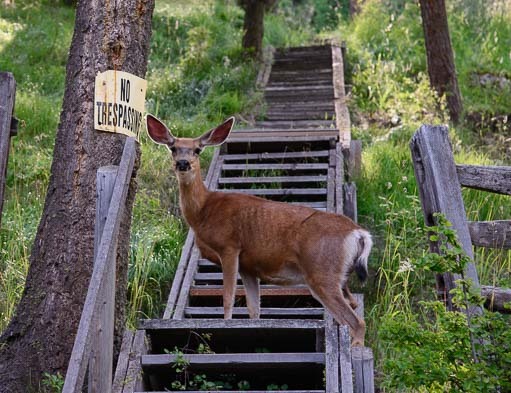 This is a “high end” RV membership program where you pay a hefty fee up front to buy into a home park and also pay an annual fee for park upkeep. However, as a member, you can stay at the 400 or so elegant member RV parks for just a few dollars a night. We’ve met several full-time RVers who make the most of these kinds of RV membership programs. One very savvy couple we met last year in Quartzsite excitedly told us they had continued to upgrade their membership and purchase more perks in the program as the years went by, which now gave them some really exceptional long term benefits. As new full-timers in their mid-sixties, they’ll have plenty of time to travel the country in style, using their membership and paying pennies on the dollar for their overnight stays. The trick is to do your research first and to negotiate with gusto. These memberships are sold in the same fashion as timeshares, giving you a tour in exchange for a few nights’ stay, but putting you on the hot seat for a few hours before letting you go. However, for the smart and knowledgeable shopper, there are real deals to be had. 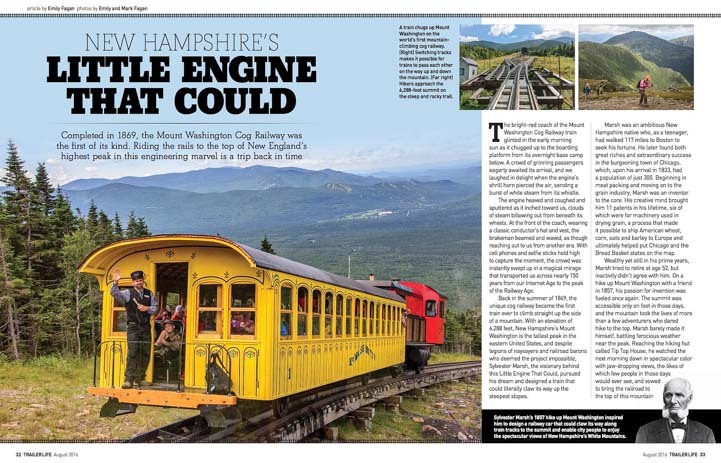 On a different but similar note, we are excited to announce that the August 2016 issue of Trailer Life Magazine is featuring our article about a really fun train ride we did in New Hampshire‘s White Mountains aboard the Cog Railway. The Cog Railway claws its way straight up Mt. Washington, the northeastern states’ highest mountain peak. It uses a cog wheel installed on the train with teeth on it that link into a special track that lies between the two conventional rails on the ground in much the same way that the teeth on a bicycle cog rotate through the links in a bicycle chain. Completed in 1869, it was the first of its kind in the world, and the story behind its creation and the inventor who conceived of it is quite a tale. 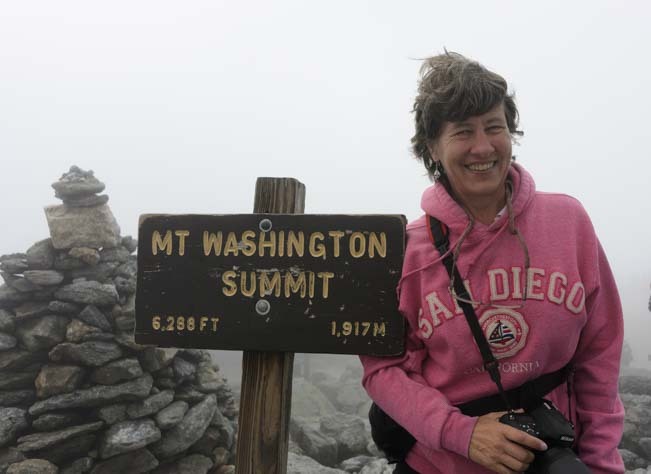 It was an extraordinary climb…aboard the Cog Railway! New Hampshire’s Little Engine that Could! Trailer Life is celebrating its 75th anniversary this year, and they have been publishing some super fun stories about the history of trailer travel and RVing in the magazine and on their website. We subscribed to Trailer Life within a few months after buying our first popup tent trailer, and we have learned a lot from reading it over the years. There’s a bit of a learning curve when you first start RVing, and a monthly magazine like Trailer Life is a great way to get a general introduction to the hobby. It offers tech tips and lifestyle ideas and articles describing major upgrades. The beauty of these professionally written articles is that they are critiqued by a team of experienced editors who make sure that every word is something they can stand behind. 1875 technology at its finest – What a great ride! 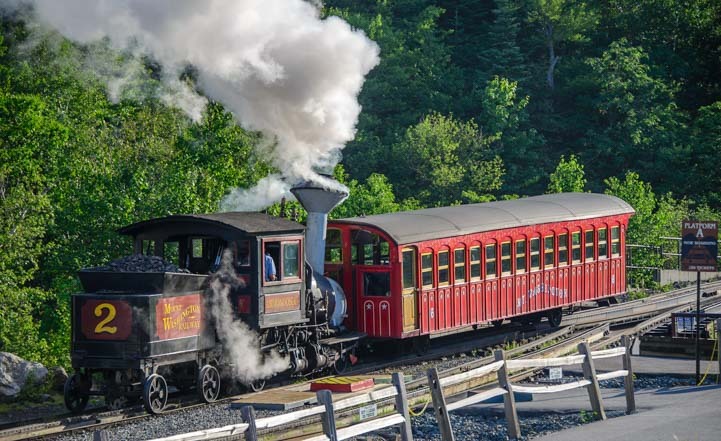 The Cog Railway’s steam train runs once a day, however, bio-diesel trains run all day long. Joseph, Oregon – At Heaven’s Door! Joseph Branch Railriders – What a ride! Hell’s Canyon – A Gorgeous Gorge! We just stayed in Baker City and experienced the Interpretive Center. What a great museum. We then traveled on to Enterprise and Joseph. Such quaint towns on roads less traveled. The drive from Enterprise to Lewiston, ID on highway 3 was quite the trip. Thank goodness for exhaust braking. We seem to have traveled similar routes. It’s a wonderful itinerary and we loved it when we did it. We didn’t do the drive up to Lewiston, ID, however. That sounded like a pretty gnarly road. I’m impressed you did it! Enjoy Idaho! !